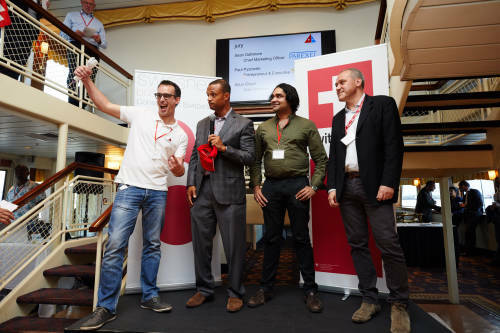 Every year since the early 2000s and in partnership with Venture Lab, the Venture Leaders, a group of representatives from the most cutting-edge startups have made their way from Switzerland to the United States. As Boston has firmly established itself as a hub for life sciences it is only natural that the companies selected for the weeklong business-building event are in the fields of medtech and biotech. They come here to learn about the U.S. market, properly structuring their companies, and to attend workshops. There is also a large focus on perfecting their pitch. Entrepreneurs looking for funding and partnerships must be able to communicate what their company does in a very clear and concise manner in order to effectively convince busy investors. swissnex Boston Project Leader for Innovation and Entrepreneurship Philippe Labouchere and Junior Project Manager Charlotte Broennimann devised an action-packed schedule and accompanied the group throughout their intellectual adventure. The Venture Leaders attended company visits and workshops at Paraexel, Babson College, MassBio, Massachusetts Life Science Center, Ernst & Young, as well as Cambridge Innovation Center where they were given constructive feedback to strengthen their pitches. 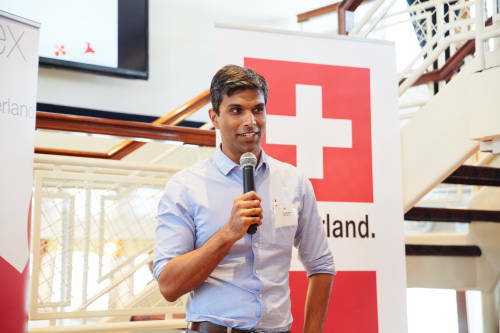 Their first pitch to a crowd occurred on Monday, June 12 at the Swiss residence of Dr. Felix Moesner, Swiss Consul and CEO of swissnex Boston. Present were experts in the life sciences and startup fields as well as distinguished guests; including the State Secretary for Education, Research, and Education (SERI) Mauro Dell’Ambrogio and Ambassador Mauro Moruzzi. 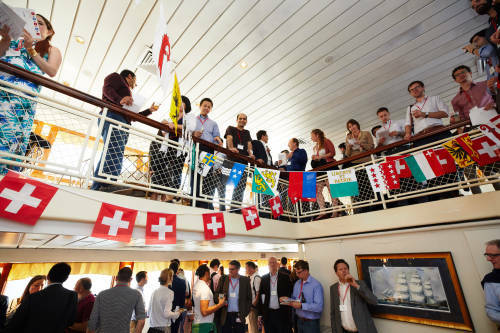 This event allowed the group to dip their toes into pitching to a large crowd before taking the plunge for the Life Sciences Global Pitch Fest on board The Majesty. Audience votes were collected dutifully by swissnex Boston staff and meticulously counted, rendering Tiba Bioetch to be the winning contender. Tiba Biotech designs novel vaccines within seven days from antigen identification and manufactures their vaccine products at scale within an additional seven days with lower capital and operational costs. They received a Swiss gift basket as a prize. Ventures, announced their pick for winner. Georges Muller of Dispencell, a solution to single cell experiments made possible by the use of a disposable and traceable single cell isolation system. The other Venture Leaders as well as the rest of the crowd cheered him on as he took the stage and received his prize, a certificate for a private coaching session with the esteemed Linda Plano of Plano and Simple to give him the opportunity to further fine-tune his pitch. Attendees were invited to enjoy the rest of the evening networking with the sun setting over the Atlantic Ocean. We would like to take this opportunity to once again thank everyone who was involved in creating such a memorable event – we hope to see you in the future!